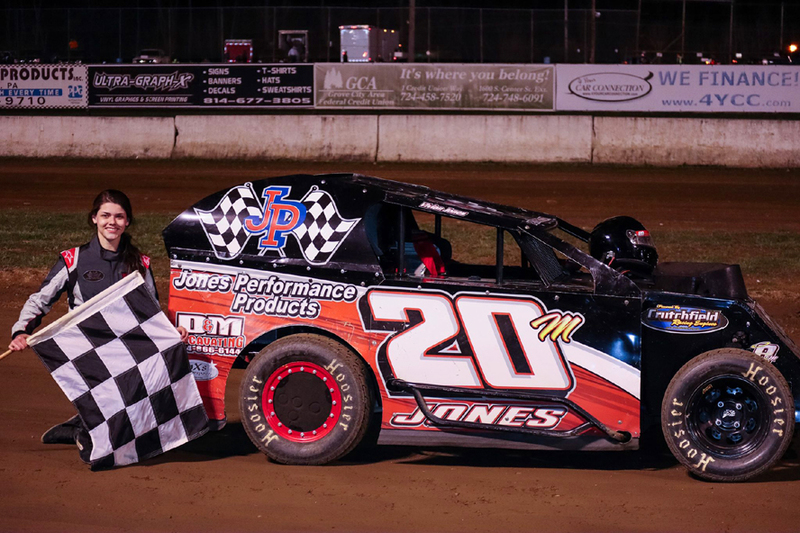 MERCER, Pa. – The old saying “third time’s a charm” rang true for Michaels’ Mercer Raceway this past Saturday where the track got their 2019 season underway. After wet weather canceled, the first two attempts warm temps and sunny skies greeted race fans and racers for the postponed Chiller Thriller. The event has become a tradition at the Mercer oval and this year’s event found the big block modifieds heading the event again. When the checkers flew it was a familiar name standing in victory lane as Rex King Jr continued his winning ways with his fourth career tour win at Mercer Raceway. In victory lane, King expressed his thanks to new track owner Ed Michaels for reopening the track and said he looks forward to competing there this season to the approval of the crowd. This season will find the RaceSaver 305 sprints in weekly competition at the Mercer oval and 305 “hot shoe” Jake Gomola made his presence known by winning the first feature of the season. Meanwhile, history was made in the mod lite feature where Vivian Jones scored the win, which made her just the second female to ever win a feature event in track history. Vivian Jones is the second woman to win a feature at Mercer Raceway. Photo courtesy Zack Anthony. Other winners Saturday included Garrett Krummert in the Fastrack limited modifieds while Todd Hanlon was victorious in the mini stock feature. Michaels’ Mercer Raceway will return to action this Saturday night when points begin for the same five divisions. Gates are slated to open at 4:00 with racing action getting underway at 7:00 p.m.
Lernerville Speedway is set to opener their 2019 season this Friday when Fab 4 racing will once again take center stage. As always action is scheduled to get underway at 7:30 sharp. AJ Flick (sprints), Rex King Jr (big block modifieds), Michael Norris (late models), and Cory McPherson (stock cars) will look to defend their crowns as the season-long point battles get underway. Sharon Speedway was set to open their 90th anniversary season with the Lucas Oil Dirt Late Model Series this past Friday but Mother Nature had other plans. Heavy rains washed out the series event for the third time in the last four tries. With the cancellation, the season opener at Sharon will now have to wait until May 4th when Tony Stewart’s All-Star Circuit of Champions will invade the Speedway. The RUSH sprint cars will join the All-Stars for this event. Sharon will also host an open practice on Saturday, April 27, giving racers one more chance to get some laps before regular racing gets underway at the Hartford oval. Some good news coming from the Clearfield area is the announcement that Hidden Valley Speedway will be reopening this season after sitting idle for many years. The track was first opened in 1992 by brothers Randy and Rodney Luzier and thrived through the nineties. This exciting quarter-mile dirt track is located just minutes off of Interstate 80. Over the past two decades, the track has seen limited success but has struggled with different owners and name changes that have plagued the speedway and have seen it sit closed and deteriorated over the years. Over the winter the track found its way back to the Luzier family and will reopen under Rodney and Kathy Luzier who hope to bring the track back to its glory days. The track will host a pair of practices the next two Saturdays afternoons (May 20th and 27th) before getting the 2019 racing season underway on Saturday, May 4, for the first time since 2013. As in years past the racing card will be highlighted by the super late models. Pure stocks, street stocks, semi lates, and mini stocks will round out the weekly card with racing scheduled to get underway at 7:00 pm. Rick Rarer, a Franklin resident, is the owner of Racestud.com and SprintCarNews.com. He has been covering racing for 18 years, taking racing photos for 13 years, and has covered races at over 100 tracks in 15 states. Most recently, Rick won the Bill Steinbach Media Award at the Lernerville Speedway Annual Awards Banquet.